Due to the popularity of the musical and movie, finding a Phantom of the Opera mask is quite simple, though making one is even easier. The Phantom of the Opera holds the title of world's longest running Broadway show of all time. The musical is based on the novel written by French author Gaston Leroux. The story tells the tale of Erik, a character whose face is ravaged by grotesque disfigurements. Erik earns the nickname "phantom of the opera" because he uses a mask to hide his hideous countenance. After the musical debuted, the phantom's half mask gained a life of its own. The now iconic half mask worn by Erik is known the world over as the Phantom of the Opera mask. Just as the novel inspired a Broadway musical, the musical begat a feature film. In 2004, The Phantom of the Opera movie was released and fans embraced it as tightly as the musical. It wasn't long before scores of people flooded costume shops looking to purchase their own Phantom of the Opera mask. While the type of material used to make the phantom mask may differ, the basic design is more consistent. The most popular version of the mask features a half-face design which covers the upper portion of the right side of the face, including the nose and forehead. The mask then tapers off, leaving the left side of the face and the entire mouth exposed. Some costume manufacturers sell a deluxe version of the mask, which covers almost the entire face. The white mask includes details, such as breathing holes in the nose area and small ridges to depict the phantom's disfigurement. 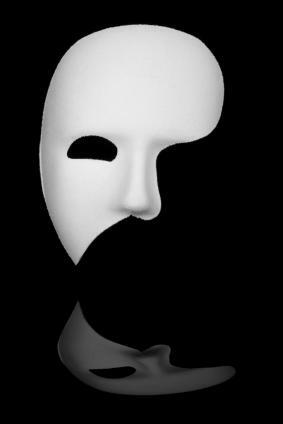 If you are attending an indoor party or an outdoor soiree in the hot summer months, then you might consider choosing a Phantom of the Opera inspired mask that is made from fabric or leather. These lightweight masks, while slightly more expensive, are more comfortable and easier to wear than heavy and hard plastic or paper mache masks the can leave you sweating midway through your costume party. If you are an avid seamstress, you'll have no problem sewing a phantom mask from leather or felt. If you are not comfortable sewing, you could consider making a phantom mask from paper mache. This option is not only easy, but it's also very affordable, as the materials to make a paper mache mask can be found around the house. All you need is a few pieces of paper and wet paste made from water, glue, starch or wallpaper adhesive. Another benefit to making your own phantom mask is that you are free to exercise creative license with your design. There are many different interpretations of what the mask is supposed to look like, but by making a homemade version you can shape the mask anyway you like or add extra personal touches, such as larger nostril holes for a deluxe mask. You could also place tighter elastic bands on the mask, so it doesn't shift when you move around.